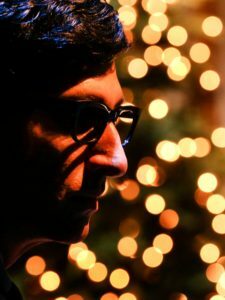 September 1, 2018: Summer may just be ending but, as you’re reminded by the snowflakes that keep drifting past the windows on the set of Hershey Felder as Irving Berlin, it won’t be long before you’re dreaming of a white Christmas. 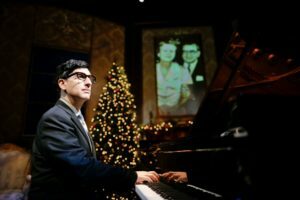 You may, in fact, even join other audience members in singing Irving Berlin’s universally popular song about that dream. 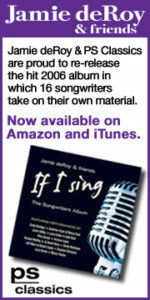 And, if you’re given to singalongs, get ready to chime in on other classics, like “God Bless America,” from the keyboard of that remarkably prolific, successful songwriter. 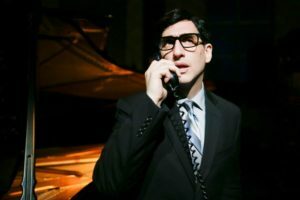 HFAIB, as we’ll call it, is the latest one-man biographical show about a great musician from the inimitable, multi-talented Hershey Felder, whose other distinguished accomplishments include incarnations of such musical icons as Gershwin, Chopin, Beethoven, Liszt, Bernstein, and Tchaikovsky. Berlin, whom Felder—in a wig, dark suit, and horn-rimmed glasses—actually resembles, is the sole visible occupant of a fashionably appointed New York apartment (elegantly designed by Felder himself, and exquisitely lit by Richard Norwood). The classy room is decked out with small Christmas trees and equipped with a large, blank frame for the many stills and video images assembled by Brian McMullen; highlights include movie musical moments starring an eye-rolling Al Jolson and a debonair, high-hatted Fred Astaire. The details of Berlin’s life, covered in multiple biographies, are well known, but it’s a pleasure to have an avatar of the man himself remind us of them. He walks about or sits at the piano to reminisce about his greatest hits (and a few less well-known early ones), singing them in full or only in snatches. Most are so familiar to many of us that only a verse or two is needed before the entire song springs instantly to mind. The show, smartly staged by Trevor Hay, is framed by setting it on Christmas Eve, 1988, not long before Berlin died at 101. 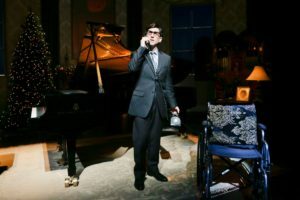 Berlin first appears as an old man, hovering over a wheelchair, then shifts to his younger self as, over the evening’s hour and 45-minutes, he gradually ages, altering his gait, posture, and voice. Each of the people he introduces—like songwriter Harry Ruby, showman Flo Ziegfeld, and his beloved wife of 63 years, Ellin—is characterized by an exaggerated version of what they presumably sounded like. Berlin, born Israel Beilin, was a poor, immigrant, Russian-Jewish boy, son of a cantor, who fled the pogroms with his family to the U.S., where they lived in an overcrowded Lower East Side tenement. His father’s job was to inspect plucked chickens to ensure they were killed according to kosher standards. Irving dropped out of school in the sixth grade, became a singing waiter (a job later journalists wouldn’t let him forget), and found wealth and international fame as a Tin Pan Alley icon. 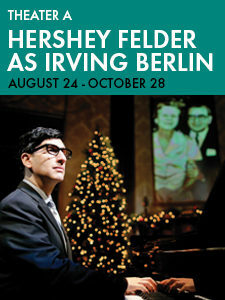 Berlin’s remarkably successful life, which included the building of his own Broadway theatre, the still active Music Box, is recapped with wonderful anecdotes, but we also witness his tragedies, like the early death of his first wife and that of one of his children by his second wife, the enormously wealthy (180 servants!) Ellin Mackay, to whom he was married for 63 years. Irving reminds us that the Berlin-Mackay marriage was one of the great tabloid stories of the day, partly because Ellin’s socially prominent father, Clarence, turned thumbs down on their nuptials. At least, that is, until the Wall Street Crash wiped him out. He also remembers, with distaste, the advent of Elvis Presley and rock and roll, phenomena that made him feel anachronistic and led to his reclusive later years. The Canadian-born Felder’s New York accent is a bit off, and he doesn’t shy from grandstanding when singing or piano playing. But these are minor drawbacks; it’s impossible to think of anyone else who could not only write and design but perform such a show with similar musical virtuosity, assurance, and aplomb. 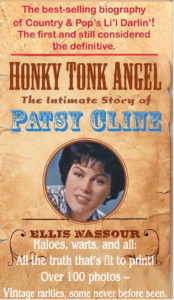 Berlin’s songs, many of them written for Broadway shows (Annie Get Your Gun, for example) and Hollywood, were the lifeblood of America’s pop music during the first half of the 20th century. Today, though, apart from seasonal or ceremonial anthems like “White Christmas,” “Easter Parade,” and “God Bless America,” one wonders how many Berlin classics the average nontheatrical millennial can recognize. Putting “There’s No Business like Show Business” aside (everyone knows that one, right? ), can they identify “Alexander’s Ragtime Band,” “Oh! 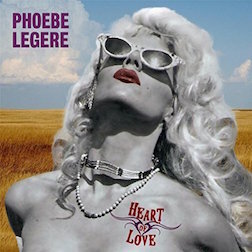 How I Hate to Get Up in the Morning,” “Suppertime,” “A Pretty Girl Is Like a Melody,” “What’ll I Do,” “Blue Skies,” “Puttin’ on the Ritz,” or “Cheek to Cheek,” all of which are represented in this show? Even if they can’t, it would be nice to know they’ll love them when they hear them. 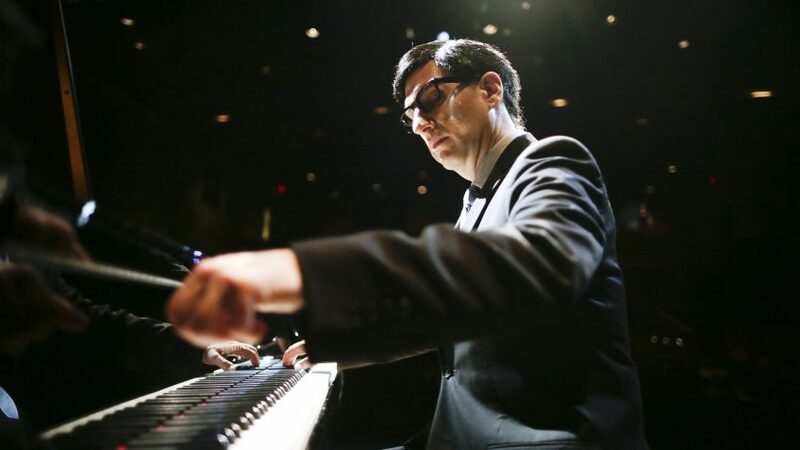 Singers, songwriters, musicians, and fans of the American songbook will continue to find inspiration in Irving Berlin’s songs, which, in their melodic and verbal accessibility, not to mention their emotional and comic immediacy, embody not just the spirit of their times but the American spirit itself. As HFAIB hopefully suggests, we’ll be loving them, always.